Preheat oven to 350°F. Line a 12-cup muffin tin with paper liners. In a small bowl mix the crushed cookies and the melted butter. Press the cookie crust into each muffin liner, being sure to make a crust all the way up the sides. This ensures that your mini pies can be freestanding once you remove the muffin liner. Bake for 5-7 minutes. Remove from the oven and set aside. In a small saucepan whisk the sugar, cornstarch, and salt. In a small bowl, whisk together the egg yolks and milk. Over medium heat, slowly whisk the milk and egg mixture into the saucepan containing the sugar and cornstarch. Whisk constantly until the mixture thickens and just comes boils, ~5-8 minutes. Whisk in the melted chocolates and instant coffee until the chocolate is uniformly distributed. Push the pudding trough a fine strainer, to remove any lumps and produce a silky smooth pudding filling. Refrigerate for 2 hours, or until the pudding is thick and cool. Using either a spoon or a piping bag, place the pudding into the prepared crusts. Refrigerate for at least 1 hour. Remove mini pies from muffin tin and peel away the paper liners. On high speed, beat the heavy cream, vanilla, and sugar until the cream forms peaks. Pipe the whipped cream onto the mini pies. Dust with cocoa or decorate with chocolate curls. Serve and enjoy! These can be prepared a day ahead and kept in the refrigerator. 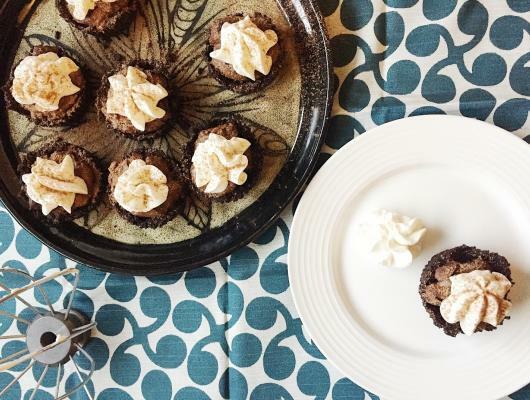 With a thick chocolate cookie crust, creamy chocolate pudding, and light whipped cream these Mini Chocolate Cream Pies are delicious handheld chocolate desserts for any occasion!